Belgrad Forest is a natural forest located north of Istanbul. It is a popular picnic area and may be crowded at the weekends, but the trails are quiet most of the times. There are many options from easy to technical tracks, some on dirt and some asphalt is also available. The forest is located near Black Sea coast and the elevation changes wildly across the forest, so be prepared for a lot of downhills (and climb of course!). The track is usually a car-width. A: I don't recommend riding in traffic in Istanbul, way too dangerous... metro is a safer bet. 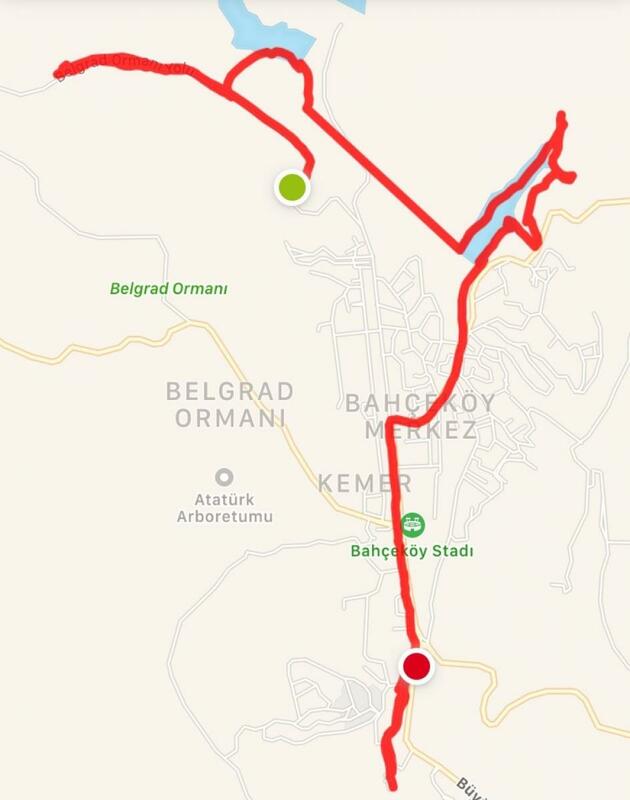 you can also consider bahcekoy bus line which terminates very close to the entrance of the forest. once you enter, take the road on the left and dive into the trail on your right which is blocked by a log, 1 - 2 km from main entrance. happy riding. Review: Nice system inside a municipal park. Lots of elevation change, some single track, mostly wide/packed foot trails and fire roads, with a paved road system running through the park. (Beginner-Intermediate) About an 30 min cab ride north of Istanbul (ask for a station wagon cab). Apparently 99% of the Ubers here are vans as well for parties of 2 or more. Review: Belgrad is full of different style of tracks for everyone, most of the trails are wide enough for fire trucks but there are less beaten paths for more technical riding. Area is not flat at all, there are many climbs and downhill sections, and it can be quite challenging, especially when there is mud due to rain or snow. Area is best to avoid on Sundays due to crowds coming here for picnic, but it's still possible to ride quietly even in most crowded days, because it's a huge forest and you'll find areas to avoid the crowds. I strongly suggest visitng it during the week though, sometimes I ride for hours without seeing a single soul... (except for the deers, eagles and other exotic animals that still survive)... Contact me if you are interested in visiting this trail and need guidance. Belgrad Forest MTB Trail 4.50 out of 5 based on 2 ratings. 2 user reviews.